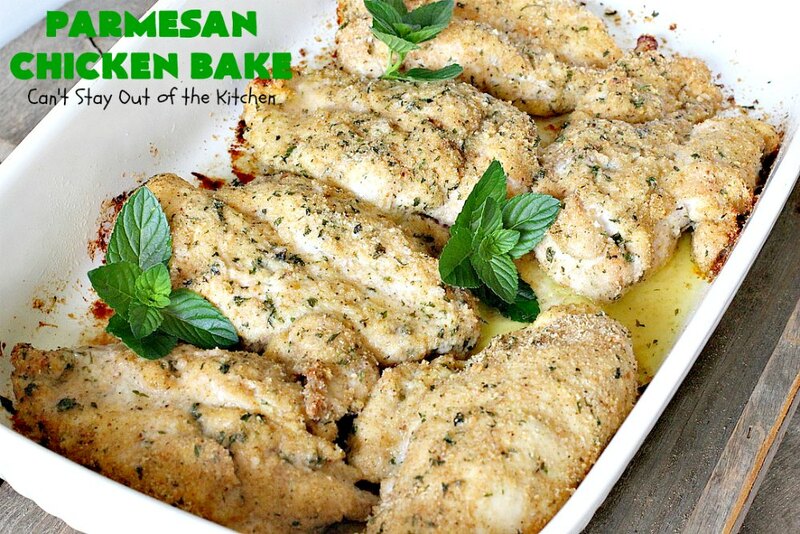 I just love Parmesan Chicken Bake! No kidding, this chicken entree is spectacular. Am I allowed to have a favorite chicken recipe? Well this is it even though I have hundreds of wonderful chicken dishes. It is a tasty, succulent, chicken dish that can be ready for the oven in about five minutes. This is probably my most-used recipe over the years. I can’t tell you how many times I have served this recipe. Probably hundreds, literally! It is my go-to baked chicken recipe for company as well as just fixing a meal for family. Parmesan Chicken Bake is a scrumptious main dish that can be paired with so many other casseroles. Over the years I have added or cut back on the butter in the recipe trying to cut out some of the extra calories. Recently, I made it with just cooking spray and it wasn’t too bad. It’s also good with olive oil drizzled over top instead of the breaded chicken dredged in melted butter. This main recipe is good for almost any kind of meat. 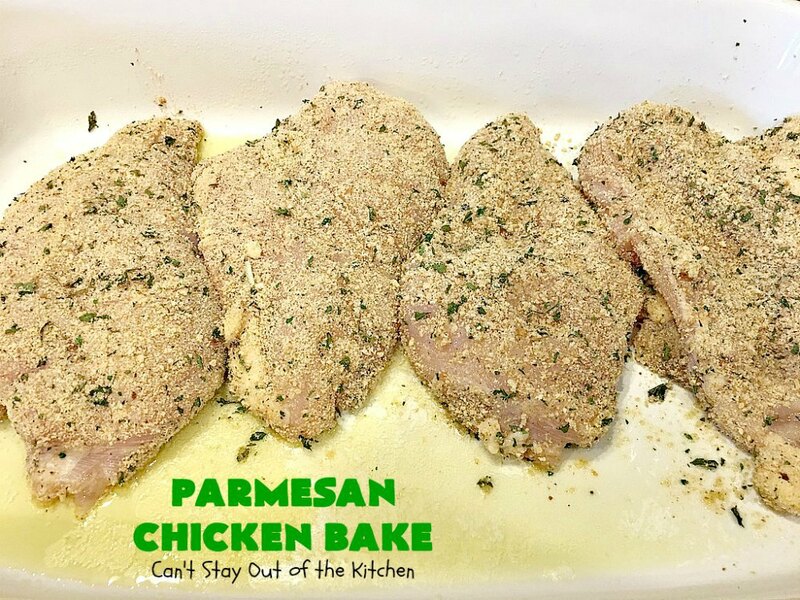 I’ve used it for pork chops, turkey cutlets & even with a sheet pan dinner with veggies. 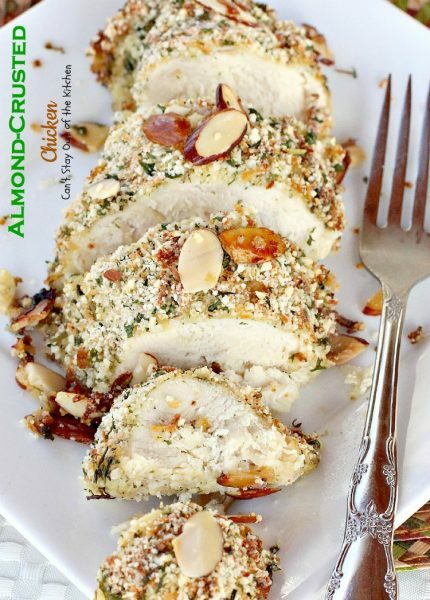 I’ve altered the ingredients with Rosemary & Romano, with different herbs, and with almonds and almond flour. I’ve even used gluten free bread crumbs to keep the recipe gluten free. No matter how I make it this scrumptious chicken entree turns out like gold! Ann Bingham shared this wonderful recipe with me back when we lived in New England. Her husband, Yates, was the director of the New England Baptist School of Ministry at the time. It was kind of like a satellite campus from The Southern Baptist Theological Seminary. I was cooking meals for students for some campus conference meetings with Ann and we got to talking about recipes. Ann offered me this one and from the first bite our family was totally hooked on this recipe. Yates has passed on to glory and I haven’t kept up with Ann over the years. But during our years in New England, Carolyn Allen and I catered a lot of meals in the school’s kitchen for the convention office and Ann was a wonderful encourager to both of us. If you’re looking for a wonderful go-to recipe your family is sure to love, give Parmesan Chicken Bake a try. We love it and believe you will too. 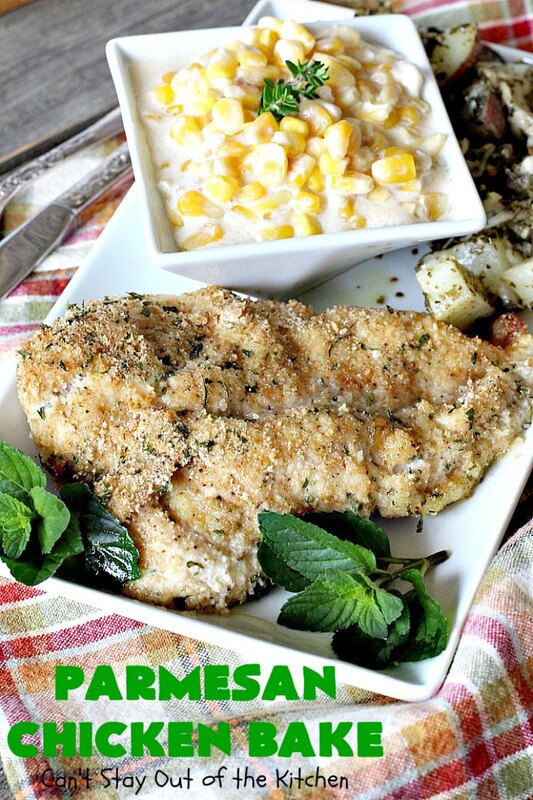 This is still by far one of our favorite chicken entrees. It only takes 5 minutes to be oven ready and it’s ready in an hour. I still don’t think this recipe can be beat. The ease, taste, texture, and how many different kinds of side dishes you can serve it with is amazing. It’s also perfect for company or holiday dinners like Easter, Mother’s Day or Father’s Day. Give it a try and you’ll see what I mean. Parmesan Chicken Bake is our household’s favorite chicken recipe — hands down. 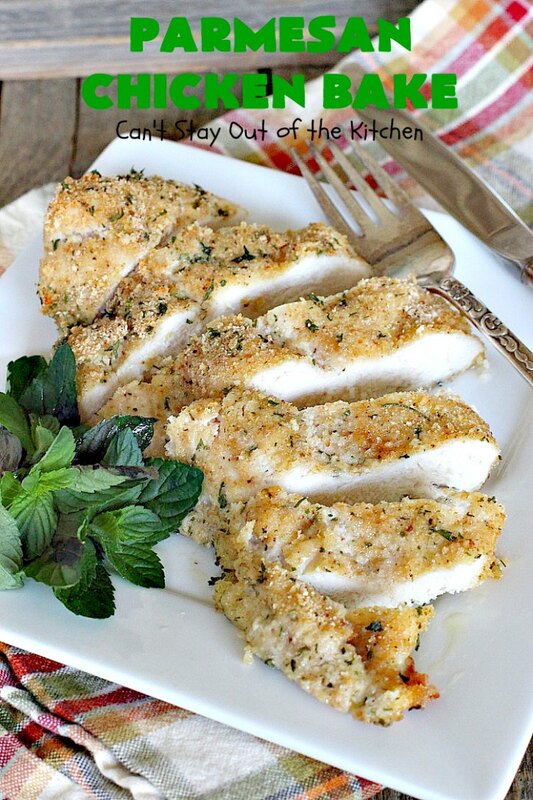 This chicken entree is so easy to make, yet so tasty. 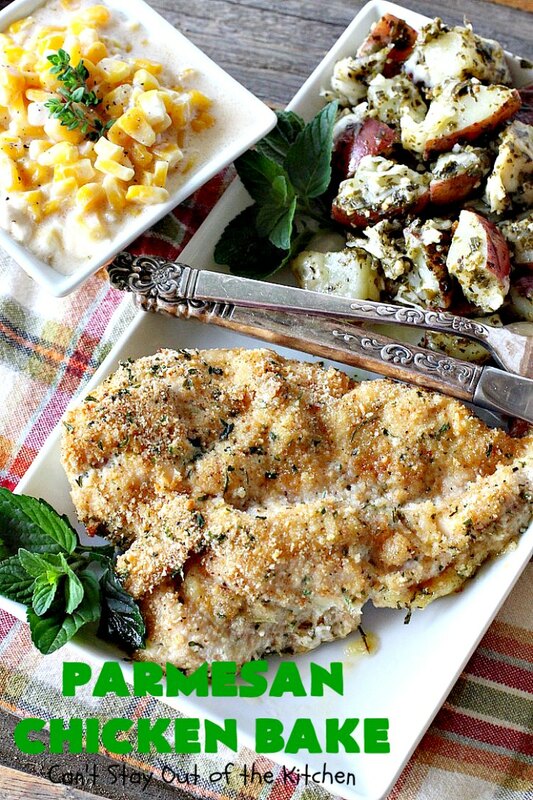 I served Parmesan Chicken Bake with Pesto Red Potatoes and Best Ever Slow Cooker Creamed Corn. Parmesan Chicken Bake is tasty, sumptuous, and wonderful dinner fare for your family or company. I have used this recipe so many times over the years. I’ve changed out the seasonings, substituted gluten-free bread crumbs and tried many different herb combinations. 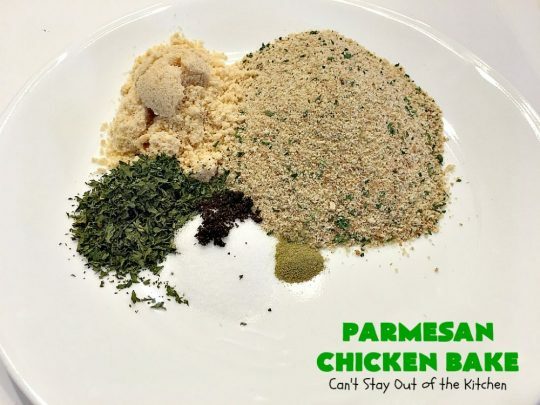 It’s also good with panko crumbs. You can even use different cheeses although this is probably the easiest. But if you want a little variety, try some different herbs or spices after you’ve made it this way a few times so you know what to expect. 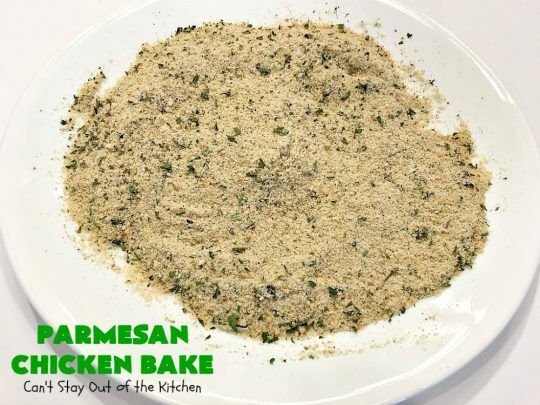 Spread Italian bread crumbs on a plate. Add parmesan cheese, parsley, thyme, lemon pepper, and salt. Meanwhile melt the butter in a large baking dish. (I used a 10×15″ glass baking dish.) Put in 350 degree oven until melted – about 5 minutes. 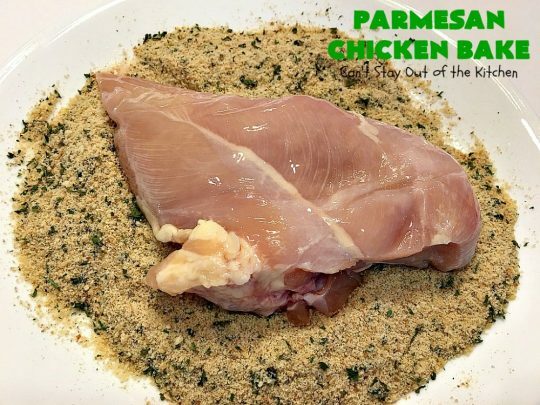 Place chicken breasts into breading mixture. Coat chicken well on both sides. I pat the crumbs into the chicken so every crevice is well-covered. 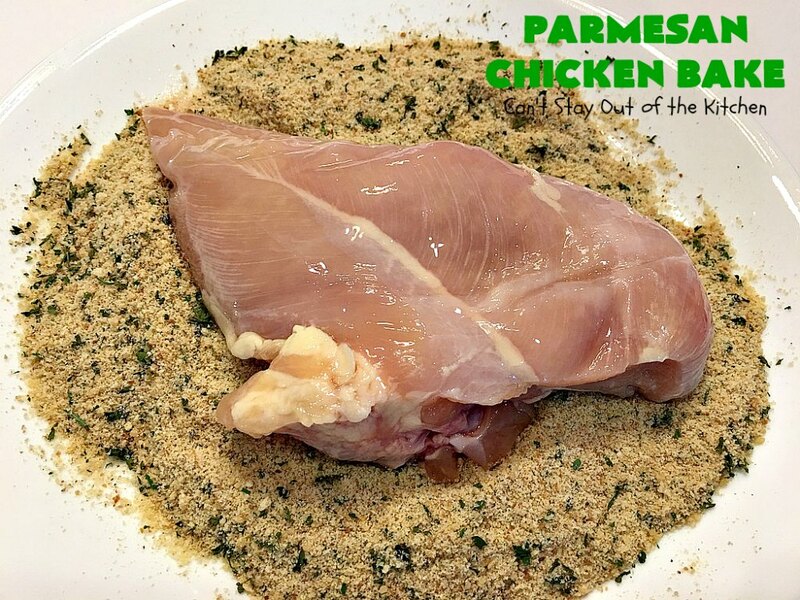 This recipe is enough to coat 4-6 small to medium chicken breasts. 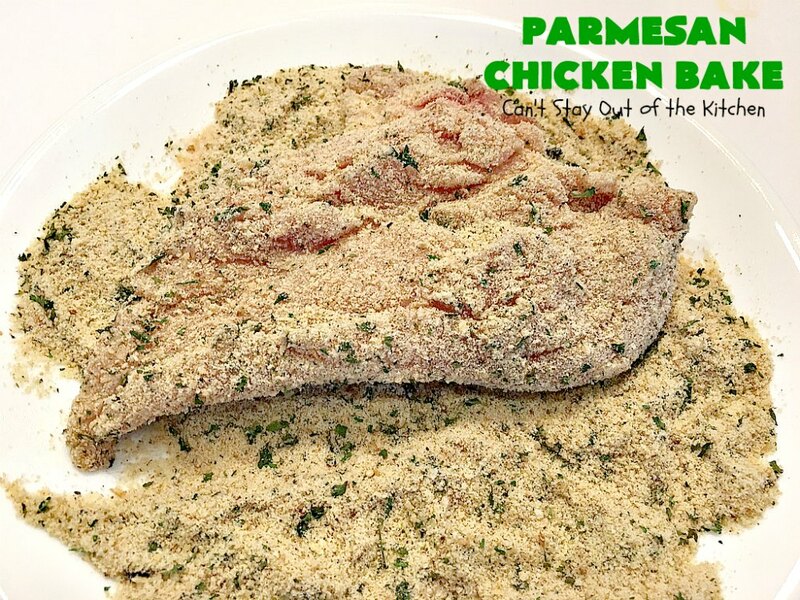 Place chicken pieces dredged in Italian crumb mixture into the melted butter. Now turn chicken pieces buttered-side up. Bake at 350 for about 1 hour. Wow! Doesn’t Parmesan Chicken Bake look fantastic? We love the moistness of this chicken dish. Parmesan Chicken Bake is particularly wonderful served with Pesto Red Potatoes and Best Ever Slow Cooker Creamed Corn. All three recipes are relatively easy and take very little time to pull together. 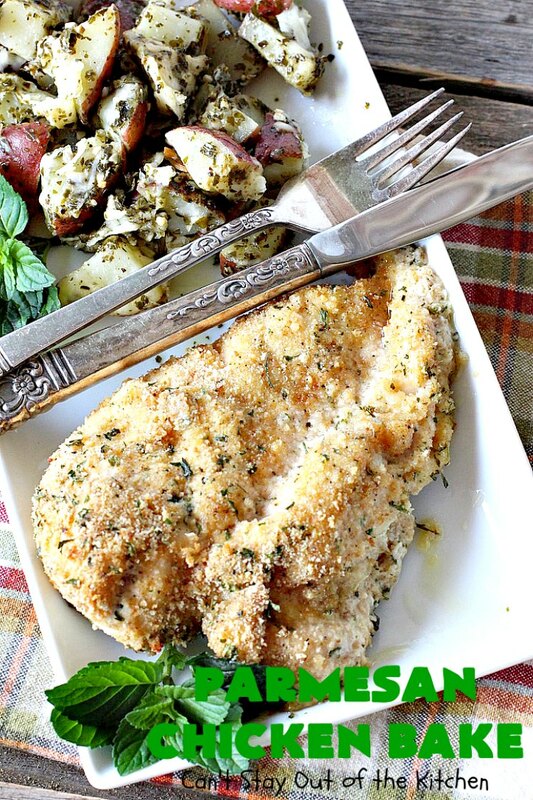 Parmesan Chicken Bake is our favorite chicken dish. 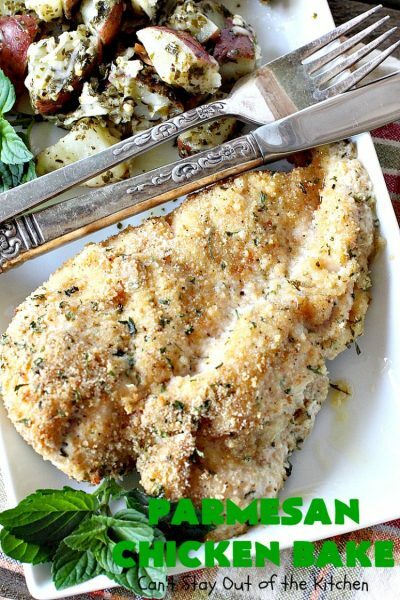 It's made with a simple breading from Italian bread crumbs, parmesan cheese, thyme, parsley, lemon pepper and dredged in melted butter. It's terrific for company or holiday dinners like Easter, Mother's Day or Father's Day. We love this recipe. Combine bread crumbs, cheese and seasonings in shallow dish. 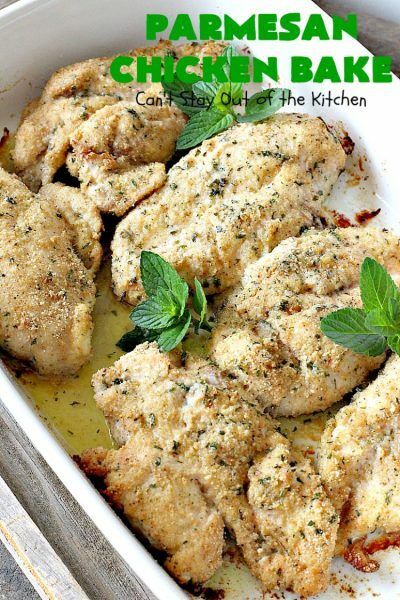 Dip chicken in crumb mixture. Coat both sides well pressing with fingers so crumbs adhere well. Melt butter in 9x13” baking dish in oven. Add chicken, turning to coat both sides with butter. Bake, uncovered, for 1 hour. NOTE: Instead of using butter, this is also good with olive oil drizzled over the top and olive oil cooking spray on the bottom of the pan. NOTE: I've also made this dish gluten free by using 4C brand gluten free bread crumbs. I purchase them at Walmart. 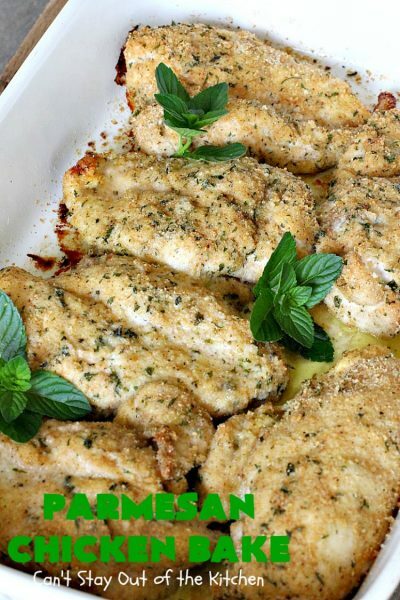 Favorite chicken dish with breading from Italian bread crumbs, parmesan cheese, thyme, parsley, lemon pepper and drizzled with butter. 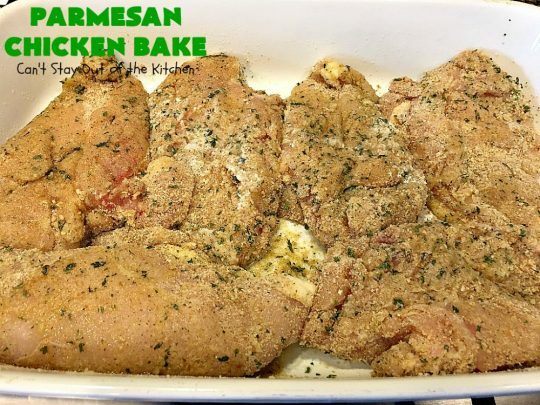 BEST chicken recipe. Melt butter in 9×13” baking dish in oven. Add chicken, turning to coat both sides with margarine. 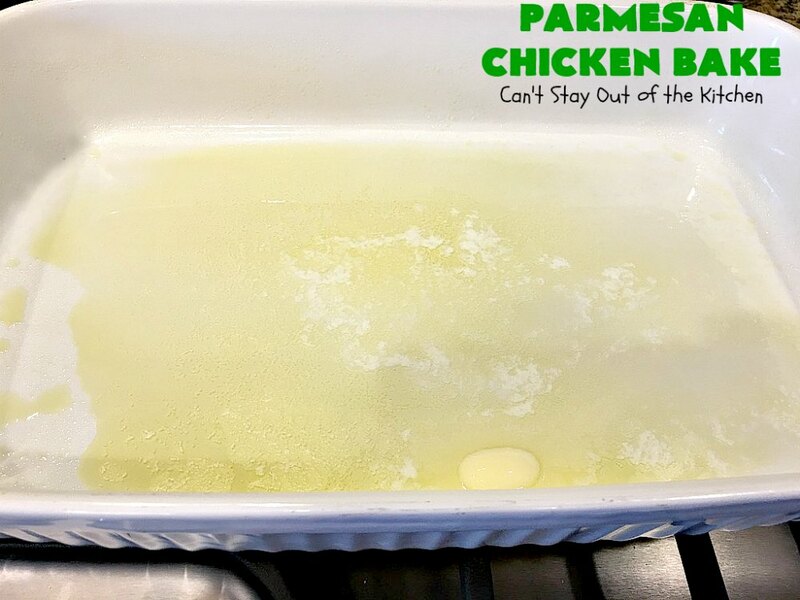 Instead of using butter, this is also good with olive oil drizzled over the top and olive oil cooking spray on the bottom of the pan. 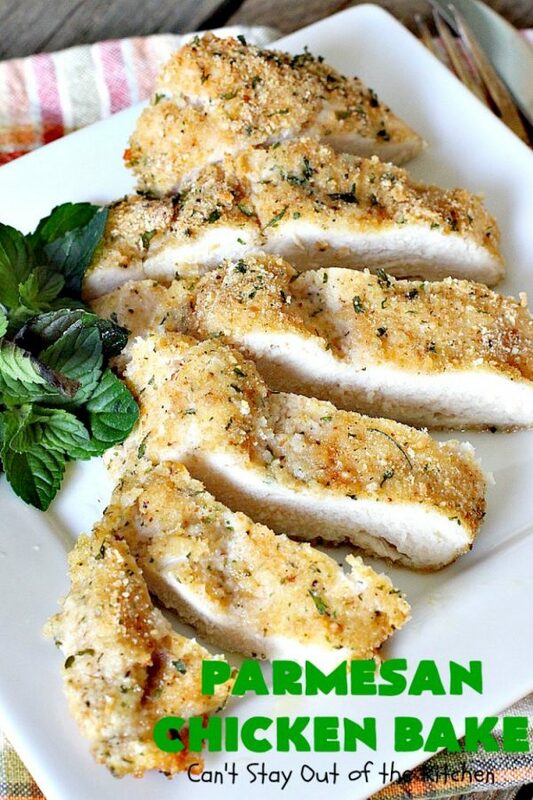 I like easy, and this chicken entree is certainly easy! Yum, yum. Most of our dinner guests cut these chicken breasts in half and still had ample food. 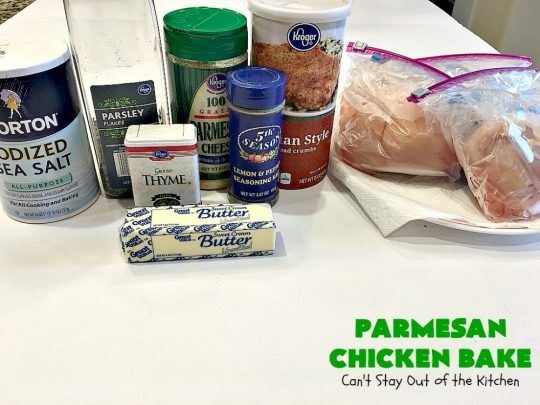 Parmesan Chicken Bake is an economical dish for your family, too. It’s very inexpensive to make. If you are trying to cut corners, then make this with bone-in chicken, just adjust your time accordingly.